Beautiful ! I have a black granite tile floor and this is perfect in the kitchen. Safavieh's Adirondack collection is inspired by timeless vintage designs crafted with the softest polypropylene available. 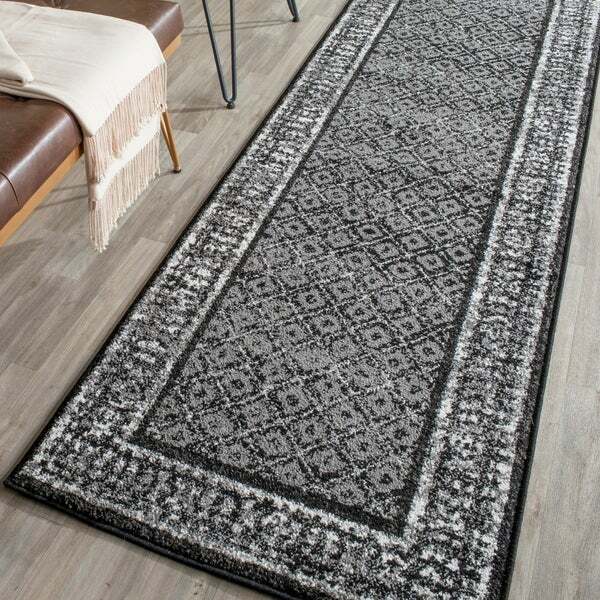 This rug is crafted using a power-loomed construction with a polypropylene pile and features main accent color of black.Inspired by global travel and the bold, colorful motifs adorning fashionable ski chalets, Safavieh translates rustic lodge style into the supremely chic and easy-care Adirondack collection. Crafted of enhanced polypropylene yarns, Adirondack rugs explore stylish over-dye and antiqued looks, making striking fashion statements in any room. I purchased 3 sizes. Very happy with them. Looks great in my new kitchen. Great prices!!!!!! The rug itself is thin and should be used with a rug pad. I bought this rug to go by the entry from the garage. A high traffic area. Rug is holding up well with no sign of staining. Only issue is the corner that is most "walked over", keeps curling up. I have folded it under to try and "train" it to lay flat but it doesn't seem to want to stay flat. otherwise, happy with the rug. Purchased this rug for my master bathroom. It is the perfect color and adds class to the bathroom. This looks great in my hallway. I bought several rugs in this design and one complimentary design. I love the Safavieh products for looks and quality. No matter what I did (used a mat under it), rug would not lay flat. I tried rolling it the opposite direction and leaving it for several days and it would just just show the original "roll marks." The corners of the rug started to fray as well. Finally, I just threw it away as it never laid flat. Very unhappy with this purchase. Great addition to any room. Rug is great and works well in the laundry. Have it in my master bath and like it a lot. Not too thick. Nice color and pattern. Looks more expensive than it is. Bought two of these and I am very pleased with them. 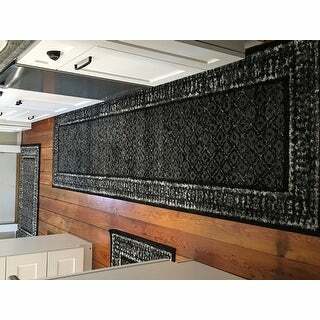 I have owned this rug for over a year now at our entry with lots of foot traffic and it still looks like new! We have this in our front entry - looks really nice - good quality also. Very happy with our black/silver runner. I like the design and color will compliment my kitchen. Because I already bought 3 of these rugs & needed one more. "how do you clean this rug"
Vacuum your rug at least once a week. Most manufacturers recommend disabling beater bars and brush bars when vacuuming rugs. Get a professional cleaning done every one to two years. Blot spills as quickly as possible with a white cloth; then spot treat.